FirstCry has been in talks for nearly a year to raise fresh funds, but has not yet been able to seal a deal. Bengaluru/New Delhi: FirstCry, India’s largest retailer of baby products online, is in talks with China’s Alibaba Group Holding Ltd and Japan’s SoftBank Group Corp., among others, to raise at least $100-$150 million as it seeks to cement its market leadership, said three people aware of the discussions. The exact quantum of funds FirstCry wants to raise is, however, yet to be finalized, said the people mentioned above, requesting anonymity. Mint could not immediately ascertain the valuation that FirstCry is seeking for the latest round. The discussions with Alibaba and SoftBank are at a fairly early stage and a deal is still far from certain, said the people cited above. If the latest talks progress to the next stage, both Alibaba and SoftBank may participate in the funding round, they added. The round size could also end up being larger than the $100-$150 million that is being discussed currently, the people mentioned above said. FirstCry did not immediately respond to an email seeking comment. “We never comment on speculation," said a SoftBank spokesperson. Mint first reported on 21 June that FirstCry was in talks to raise $100-$150 million from new and existing investors and that it had spoken to a slew of potential investors, including Singapore’s Temasek Holdings and China’s Tencent Holdings. The people cited above added that while Temasek and Tencent have held talks with FirstCry, they may not invest in the latest funding round. FirstCry has been in talks for nearly a year to raise fresh funds, but has not yet been able to seal a deal. That, however, is expected to change as the latest discussions are progressing seriously, said the people cited above. 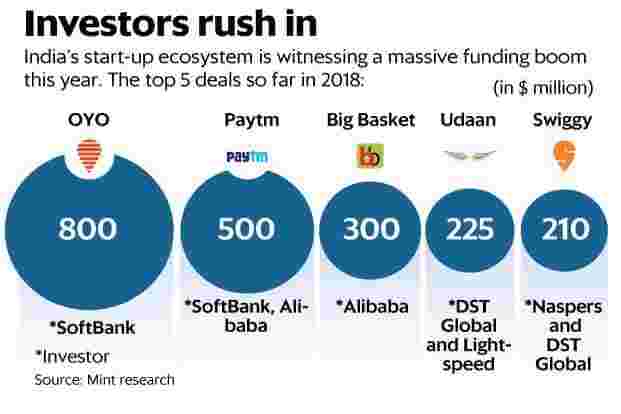 If FirstCry does manage to close the latest discussions, it will mark yet another fairly significant funding this year for India’s startup ecosystem, which is witnessing a massive funding boom that has already been compared to the 2014-15 funding bubble. Mint reported in August that a handful of relatively mature startups have been raising multiple rounds of capital in quick succession at increasingly higher valuations. Investors have already struck more than two dozen deals of $100 million or more this year compared with 22 last year, according to Tracxn data. Since its founding in 2010 by Supam Maheshwari and Amitava Saha, FirstCry (Brainbees Solutions Pvt. Ltd) has raised more than $100 million from Mahindra, IDG Ventures India (now Chiratae Ventures), New Enterprise Associates, SAIF Partners, Vertex Ventures and others. The Pune-based firm is one of the very few vertical e-commerce firms to have flourished in the past three years despite competition from Flipkart and Amazon India. Unlike many e-commerce firms, FirstCry generates the bulk of its revenue from its network of more than 300 stores, although its offline business is smaller than the online one. Most companies have struggled to expand in the babycare business that is still largely dominated by mom-and-pop stores. High real estate and customer acquisition costs have crippled the efforts of most babycare retailers to build large businesses. FirstCry has gone further than others by using its online and offline channels to offer a wide assortment of low-priced products to customers.